Is It Okay That I Run the Dishwasher Every Day? I have a confession to make: ever since I moved into my new apartment, I’ve been running the dishwasher every day. Even when it’s only as full as that it is in that photograph. When I do a smallish load of laundry — and believe me, being able to wash my whites by themselves has significantly improved their brightness — my washing machine automatically calibrates the water level to the amount of clothing inserted. Then I save money by skipping the dryer and putting everything on my drying rack. But every time I fill my dishwasher halfway (or a third of the way) and start the wash cycle, I wonder how much money and water I’m wasting. To be fair, this new dishwasher is so good that I don’t have to prewash (or presoak) any of my dishes. At all. I spent the first week in my new apartment testing its ability to remove dried-up gunk, and am very glad to report that it can handle egg residue on a frying pan, split pea residue inside a bowl, etc. etc. etc. So maybe I’m saving money and water by using my sink less often. I’d say the proof will come when I get my water bill, but since that also includes showers and laundry and the toilet, I won’t be able to accurately suss out how costly my half-full dishwasher habit really is. A quick survey of the collected research suggests that dishwashing is in general more efficient than handwashing, if you have a new machine (which I do) and if you fill it to capacity (which I don’t). So what would you do if you were me? Keep doing what I’m doing? 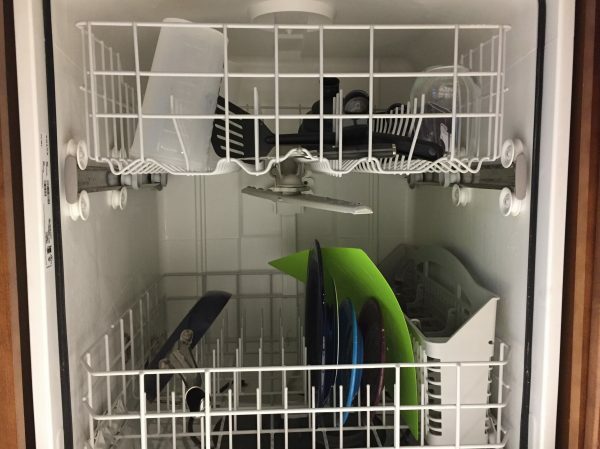 Put the dishes in the dishwasher and close the door and hope the bugs stay away until there are enough dishes to do a full load? (There’s not an option to do a pre-rinse; it’s either full wash or nothing.) Accept that I have to go back to handwashing, even though I finally have an apartment with a dishwasher in it? I should also buy more spoons at some point. (And forks.) It really is a good idea to own more than four.